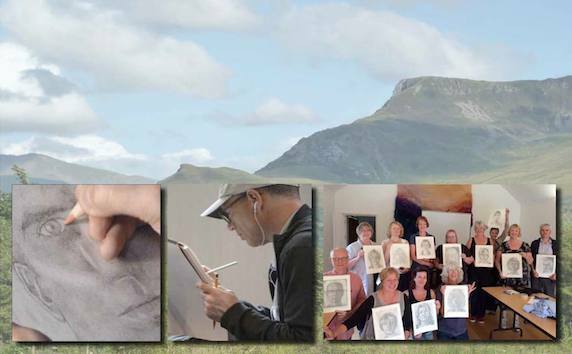 Courses for next year's 5-day Drawing on the Right Side of the Brain® workshops in the UK are filling up fast. Five Tips on Creating Light and Shadow Create mood and depth in a drawing by strengthening your lights and shadows. (1) Use an angle poise lamp to direct light where you wish. This will create strong light and dark shapes to draw. (2) Try laying a ground ie. a thin layer of graphite on your paper first. You can use a graphite stick and then rub down with tissue/Kleenex. This then becomes your middle tone – your darks have to be a lot darker and your lights lighter to create a range of values. 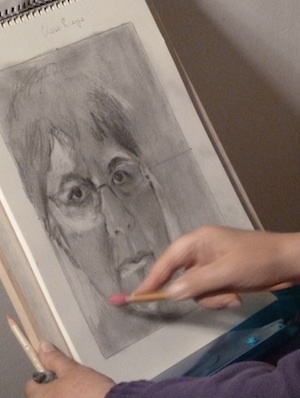 (3) Focus on drawing the negative shapes of the lights and darks in your picture and the subject will emerge for free. (4) Experiment with different types of pencil – they come in all ranges and get used to using a wide range of pencils in a drawing. 10B is the darkest but it will also be softer and therefore smudge more. (5) When you think you’ve finished your drawing, put it down and step back from it. Does it have a full range of values from light to dark? If not, go back and look at your subject and keep asking yourself ‘where is the lightest light? Where is the darkest dark?’ and work across your whole drawing in this way.